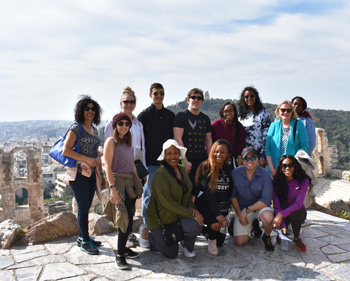 While thousands of U.S. college students spent their spring break getting away from the pressures of studying and exams, many at Webster University took advantage of unique short-term study abroad opportunities to enrich their studies around the world. 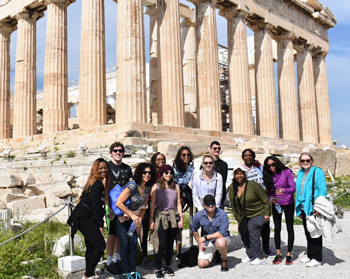 Among them were the 11 students who met in Athens, Greece, for the study abroad component of the “Commerce in Athens” course taught by Debbie Psihountas, professor in Webster’s George Herbert Walker School of Business & Technology. The group also fit in a visit to the seaside ancient Temple of Poseidon. Students began the course online at the end of January, with a mix of graduate and undergraduates in the cross-listed course hailing from all across the United States. With jobs and responsibilities preventing some students from spending a whole term abroad, these short-term offerings are a great way for undergraduate or graduate students to experience Webster’s award-winning study abroad program. These “hybrid” courses combine several weeks of a typical online course with an actual full week of study abroad. “I'm thankful that Webster has come up with some creative alternatives to missing study abroad altogether,” said Psihountas, who personally has offered hybrid courses multiple times in China, Thailand, Greece, and London. The hybrid courses also leverage Webster’s online programs, which not only offer a flexible learning modality, but also bring students together from across the country and the world. In Psihountas’ course, students hailing from Los Angeles; Washington, D.C.; North Carolina; Georgia; Springfield, Illinois; and Webster’s home campus in St. Louis, Missouri, all met in person for the first time for dinner on Sunday night. Psihountas shared more about the course to provide an inside view of how a short-term hybrid study abroad course works. Students visited Tsakos Shipping, part of a trillion-dollar industry. 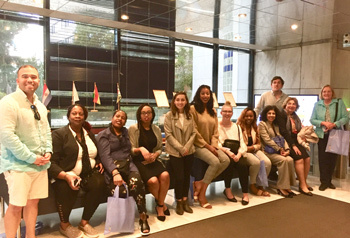 Over the course of the week, the Commerce in Athens students experienced six corporate visits with a variety of different businesses in Athens, a full three-island boat tour to experience the different business environment and pace of island life outside the capital. They also met the CEO of a top shipping firm – part of a trillion-dollar global industry -- founded and headquartered in Greece, where one-quarter of the world's merchant fleet passes through. Other commercial visits included tourism-related businesses such as a hotel chain expanding in Greece, a pistachio farm owner and product producer with a successful retail operation on one of the islands. “We also visited a Greek business incubator funded by one of Greece's major national banks, which gave my students great insight into the drive to build new enterprise in Greece, where many remain unemployed or underemployed after the very hard-hitting recession of 2007-2010,” Psihountas said. 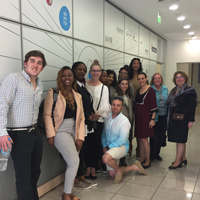 Students also received a private tour with IKEA in Greece, learning how the Swedish retail giant trains its workforce, the relationship between size of bag or retail cart used and average sale ticket, and more. One undergraduate student has already made contact with one of the business owners and has sent him a couple of ideas that she told him she'd be willing to work on with them. “Talk about taking the bull by the horns and creating your own path!” Psihountas said. “This undergraduate student may very well be back in a year consulting with this organization, presenting her research and ideas on how they can continue to expand their business model." commercial visits and presentations of their coursework. 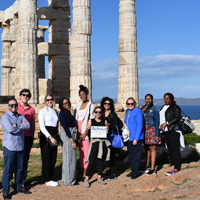 Students also enjoyed more traditional traveler destinations, such as a tour of the Acropolis and the Parthenon, a walking tour of the ancient Agora in Athens, and a visit to the seaside ancient Temple of Poseidon at Cape Sounio, built in approximately 470 BC. And of course they enjoyed the experience of being together in person, with two guest lecturers come to the Athens campus, a number of group lunches and dinners shared together, as well as meeting a class to do in-class presentations based on their research into an aspect of business or culture in Greece to prepare for the trip. Naturally there was some apprehension for some at the beginning of the trip, trying to acclimate to a new environment and different time zone, Psihountas said. But all of that by the end of the week turns into a great experience, with many new friendships and social media connections formed among the group. Some of the students remained in Greece for a few extra days at the end of the trip to extend their stay. All of them departed with a new appreciation for what each brings to the class, and what kind of possibilities lie ahead in their own careers. “For me, as a Greek American who has led two student tours to Greece and who has gone many times on my own in the past for tourism and exploration, it was very satisfying to see the excitement of students who stand on the Acropolis for the first time, looking up at the Parthenon, and realizing what that structure represents, how long it has stood there, and just imagining what it must have taken to construct it thousands of years ago, long before sophisticated cranes and other construction equipment existed,” Psihountas said. January, students formed new friendships in ancient settings. And such is the beauty of these short-term study abroad opportunities, and why Psihountas shared this spring break story. “Instead of vegging at home on the couch, or lying on a Florida beach, these students took the plunge and experienced a new adventure – and they were earning college credit while doing so!” she said. Learn more about Webster study abroad opportunities and application deadlines here. Learn about Webster’s George Herbert Walker School of Business & Technology programs here.